Saturday, Jan. 26, at 10:30 a.m. and 1:30 p.m. Performing more than 150 shows per year since its founding in 1980, this New York-based troupe of professional dancers and actors employs giant puppets to bring classic stories to life for young audiences. Fun for the entire family, the content also incorporates academic standards in the arts, sciences, social studies, and literacy. In “Caps for Sale,” a hat salesman falls asleep and wakes to find his hats are missing. 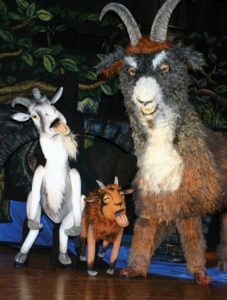 In “The Three Billy Goats Gruff,” three goats try to avoid an ogre as they cross a bridge. Tickets available at TheCenterPresents.org or (317) 843-3800.